Just imagine enjoying miles of intimate and secluded California beaches, each with their own unique qualities. Whether you picture yourself reclining under an umbrella with a good book, building sand castles with the kiddos, taking long beach walks, collecting unique seashells, or surfing the Pacific Ocean waves, you will find the perfect spot along the shores of San Diego, CA. After a day of sun, fun, surf and sand, come back to Pantai Inn. Our award-winning oceanfront retreat provides exquisite rooms, lush gardens, relaxing water features, and deluxe guest services! Shell Beach – 1 min. Shells, seals, sea lions, tide pools, and beautiful scenery – you’ll find it all here at Shell Beach, located across the street from Pantai Inn. Since this California beach is flanked by sandstone bluffs, you’ll have the most luck finding seashell treasures on the beach during low tide. For a scenic walk, follow the pathway along the bluff which heads north up to Coast Walk Trail. Seal Rock Reserve, a large offshore rock, is where you’ll discover many seals and sea lions as they rest and lie in the sun. Finally, a tide pool at the south end of Ellen Browning Scripps Park offers a great viewing spot for an array of colorful sea stars and anemones. Visit during low tide, or better yet minus tide, for the best sightings! The Children’s Pool – 6 min. This small, picturesque beach is partially protected by a seawall to provide calm conditions. Designed to offer safe swimming for children, the seals and sea lions have since claimed this spot. Although you can no longer swim here, you will enjoy watching these adorable creatures as well as the panoramic views. Windansea Beach – 8 min. 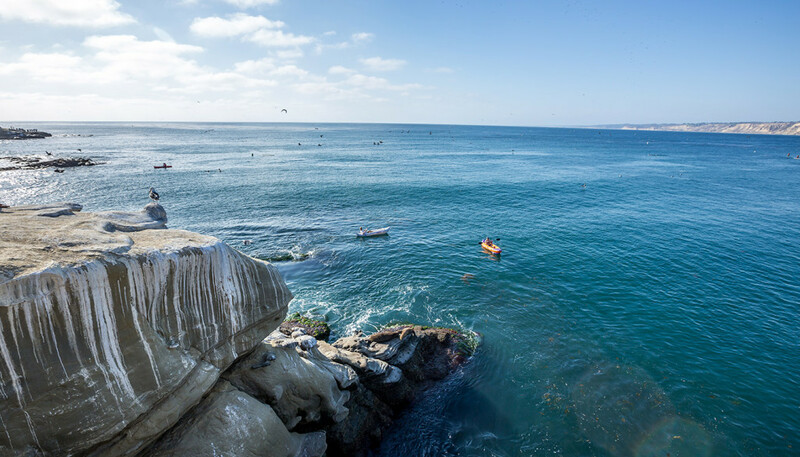 A local favorite with advanced surfers, Windansea Beach provides some of the best surfing in San Diego. The various reef formations create a beautiful scene as the surf breaks against the rocky shore. These underwater reefs also generate unpredictable conditions, which are best surfed by advanced surfers who know them well, so this beach is not recommend for beginner surfers. Many come to enjoy watching the surfers as well as the beautiful ocean and sunset views. Situated just north of Pantai Inn, this one-mile long sandy crescent-shaped beach offers gentle summer waves, permanent life-guard stations, fire-pits, bathroom and shower amenities, and nearby scuba classes – perfect for a family outing! The gentle surf also provides the perfect place to try surfing or stand-up paddle boarding. What’s more, adjacent to the beach is Kellogg Park, a grassy playground with plenty for the young ones to do! 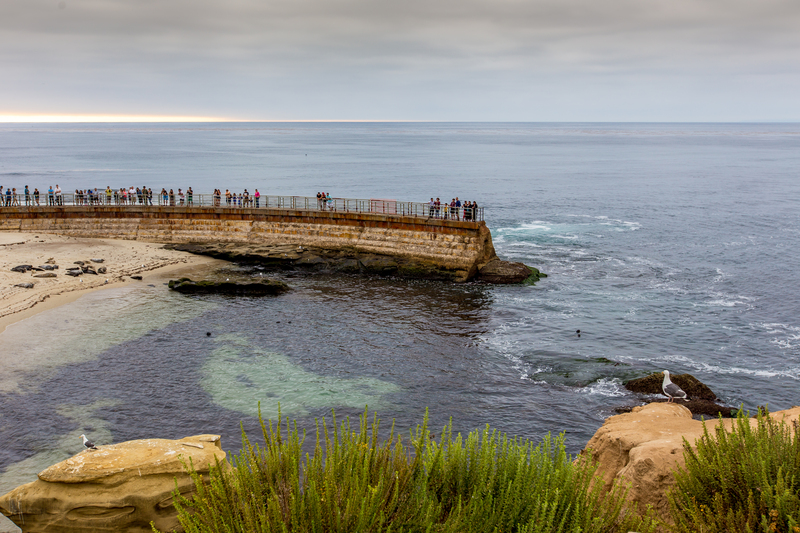 If you’re looking for something smaller and more intimate, you’ll love La Jolla Cove. Located just around the bend from Pantai Inn and tucked between sandstone cliffs, this Cove offers swimmers, snorkelers, and scuba divers a gentle surf during the summer, crystal clear water (visibility can exceed 30’! ), and plenty of marine life! Plus, nearby sea caves provide adventurists an opportunity to explore by foot or kayak. Permanent lifeguard stations, bathrooms and showers, picnic tables and gazebos make La Jolla Cove a great spot for families. Pacific Beach – 17 min. Located just south of Crystal Pier, Pacific Beach (or P.B. to locals) extends south before becoming Mission Beach. One of San Diego’s busiest beach areas, large crowds of locals and tourists alike enjoy this beach during the summer months. In addition to sandy family-friendly beaches, you’ll also find countless beach bars, restaurants, and nightclubs. Black’s Beach – 18 min. Located at the southern end of Torrey Pines State Beach, Black’s Beach has been a favorite surfing spot since it was discovered by four famous professional surfers in the 1960s. The submarine canyon just offshore channels super strong waves onto the beach, which are best surfed by experienced surfers. Black’s Beach is also known to the rest of the world as a nudist beach. Although nudism is unlawful in San Diego, it has persisted for many years, possibly due to the hike required to get here. Due to the tall cliffs and unmaintained trails, access to Black’s Beach is extremely difficult. You can access the Beach from the adjacent north and south beaches, however, access may be obstructed by high tides and surf. Also, its best to stay clear of the cliffs as they’re unstable causing unpredictable slides. North Pacific Beach – 20 min. Located just north of Crystal Pier, is the beautiful North Pacific Beach. Here you can enjoy 75’ cliffs with boardwalk and the nearby Tourmaline Surfing Park, used year-round by surfers, kite surfers, and sailboarders. Torrey Pines State Beach – 22 min. 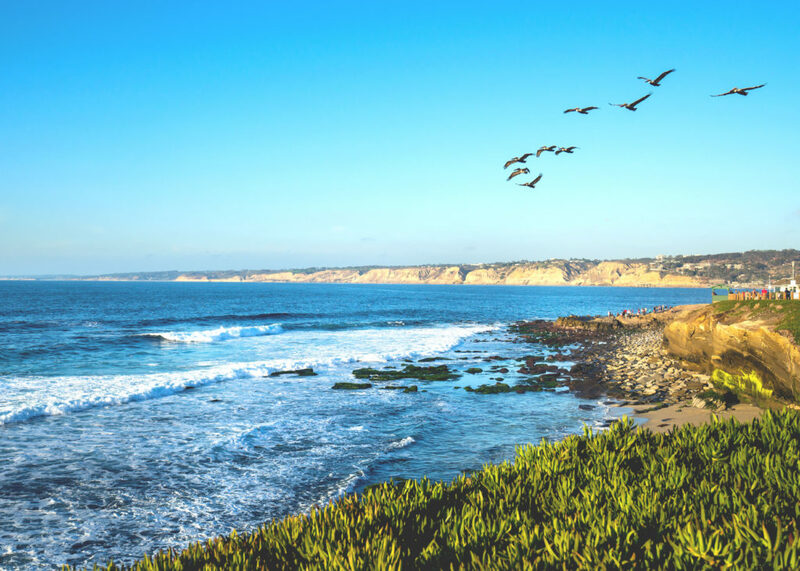 Discover towering rocky cliffs, long sandy stretches of beach, and soaring hang gliders at Torrey Pines Beach in La Jolla along historic Highway 101. Lifeguard stations, bathrooms and showers and a lagoon provide a safe spot for families and kids to play. The northern stretch of this beach is great for families, swimming and other traditional beach activities while the southern stretch, Black’s Beach, is better for surfers and the more scantily-dressed beachgoers. Mission Beach – 22 min. Located at the center of the Golden Strand is one of the most popular San Diego, California beach areas: Mission Beach. Enjoy the one-mile plus beach with permanent lifeguard stations, restrooms and showers, bus drop-off, picnic tables, volleyball, disabled accessible, surfing, swimming, and fire-pits. Adjacent to the Beach is Belmont Park. Mission Bay Beaches – 22 min. If you’re looking for something BIG, look no further than Mission Bay Park, the largest aquatic park of its kind in the country with more than 4,600 acres (roughly half land and half water). You will discover 19 miles of sandy beaches (with 8 official swimming areas) and 27 miles of shoreline dotted with various boats, water-skiers, joggers, swimmers, beachgoers, birds, fish, and more! Lifeguard protection varies by location and season. Additional amenities include restrooms and showers (excluding Enchanted Cove), fire rings for beach fires, and disabled accessibility. Ocean Beach – 23 min. Ocean Beach is situated in the San Diego community of its namesake. This wide, 1-mile long beach, broken up by several rock jetties, offers volleyball, a 24-hour dog beach (the only one in San Diego), a municipal pier for walking and fishing (catch regulations apply), and permanent lifeguard stations. Popular among locals, this happening beach is lined with bars, restaurants, and shops. It’s also home to Ocean Beach Pier, the longest concrete pier on the West Coast. Del Mar North Beach – 27 min. 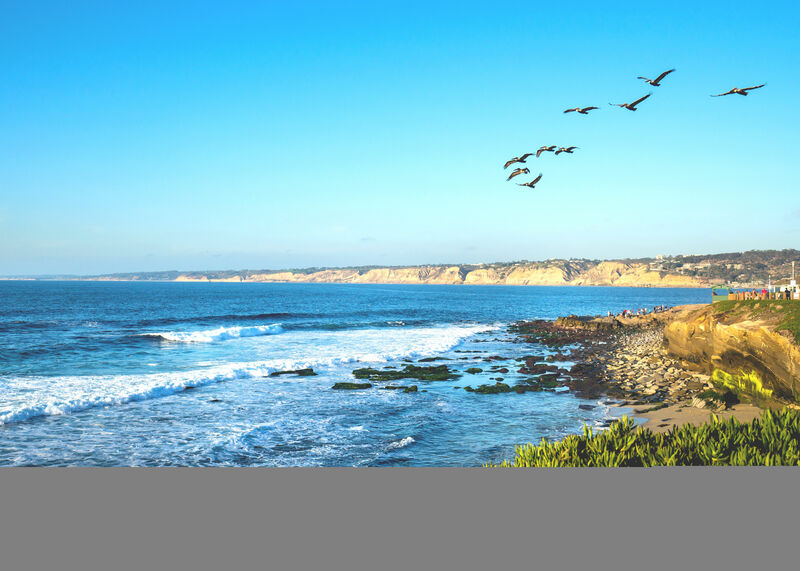 Located along the historic coast of Highway 101, Del Mar’s two miles of scenic coastline offers both family- and dog-friendly beaches where you can enjoy a plethora of activities. The River Mouth, also known as Dog Beach, offers the perfect spot to walk Fido, play some beach volleyball, build sand castles, or just relax and soak up the sun. 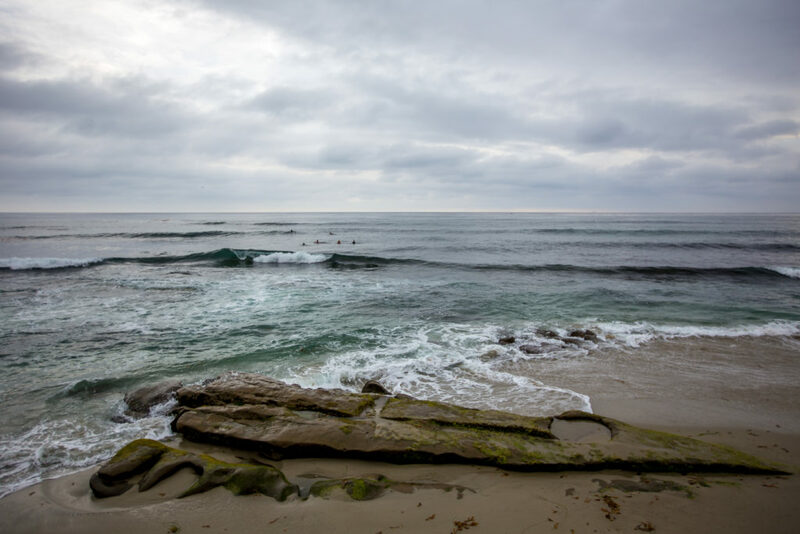 If swimming is more your style, then you’ll want to check out the northern half of Del Mar City Beach where you’ll find excellent swimming conditions and an intermediate surf. Two nearby coastal parks, Powerhouse and Seagrove, provide plenty of room for picnicking or a leisurely afternoon with family and friends. Coronado Beach – 30 min. Located about 30 minutes south of La Jolla across the Coronado Bridge are the popular Coronado beaches. 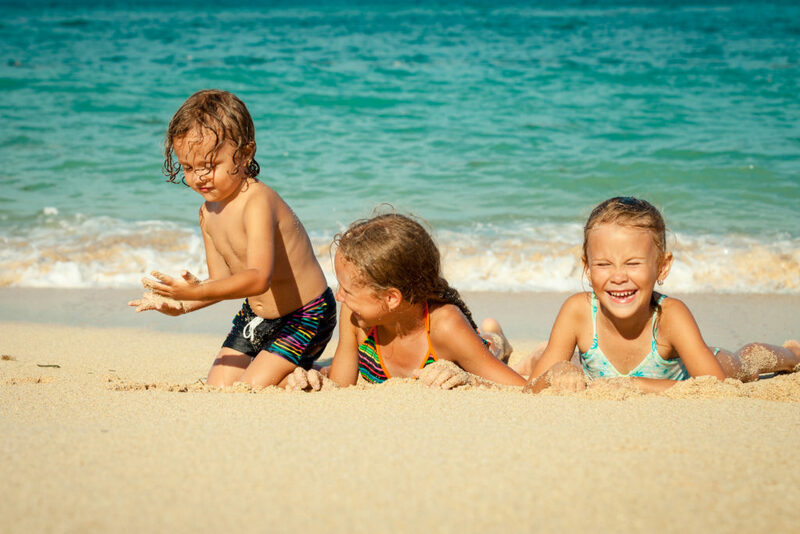 Loved by locals, visitors, and families, these beaches are perfect for a day spent at the beach enjoying the sun, sand, and Pacific Ocean waves. Book your dream getaway today at the luxurious Pantai Inn. From our beautiful suites and cottages to our deluxe packages and amenities, the Pantai Inn provides the ultimate California beach getaway!